When a mysterious and powerful vortex suddenly appears in various LEGO® worlds, different characters from DC Comics™, The Lord of the Rings™ and The LEGO® Movie are swept away. To save their friends, Batman™, Gandalf™ and Wyldstyle™ bravely jump into the vortex and quickly find themselves fighting to save all of LEGO humanity. Let creativity be the guide to a building and gaming adventure – journey through unexpected worlds and team-up with unlikely allies on the quest to defeat the evil Lord Vortech. Play with different minifigures from different worlds together in one LEGO videogame, and use each other’s vehicles and gadgets in a way never before possible. LEGO Bad Cop™ driving the DeLorean Time Machine…why not?! The LEGO® Ninjago™ Masters of Spinjitsu fighting alongside Wonder Woman™...yes, please! Get ready to break the rules, because the only rule with LEGO Dimensions is that there are no rules. Build the minifigure heroes and fire-up the game to start the experience, then follow the in-game build instructions to assemble the loose bricks into the LEGO Gateway, and place the structure on the LEGO Toy Pad. Expand the adventure by collecting more minifigures, vehicles, gadgets, and new levels with the purchase of four different types of expansion packs. Use whatever minifigure with whichever vehicle or gadget – go ahead… break the rules! 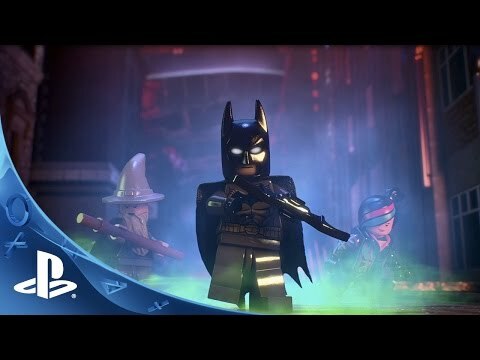 Starting in September 2016, LEGO Dimensions Starter Packs for Sony PlayStation® 4 computer entertainment system will include an exclusive, bonus DC Comics Supergirl LEGO minifigure for a limited time. The highly collectable Supergirl LEGO minifigure has many extraordinary in-game abilities to help solve puzzles and battle enemies, including Super Strength, Flying, X-Ray Vision, and Beam Attacks which enable her to shoot heat beams out of her eyes. She can also transform into Supergirl Girl Red Lantern with additional abilities such as firing powerful Red Lantern energy bolts and energy beams from the Red Lantern Ring and forming Red Lantern Energy Constructs. When a mysterious and powerful vortex suddenly appears in various LEGO worlds, different characters from DC Comics, The Lord of the Rings and The LEGO Movie are swept away. To save their friends, Batman, Gandalf and Wyldstyle bravely jump into the vortex. As they journey to locations beyond their wildest imaginations in search of their friends, they soon realize that Lord Vortech is summoning villains from across different LEGO worlds to help him gain control. As his power grows, worlds mix, unexpected characters meet and all boundaries are broken. Our heroes must travel through space and time to rescue their friends before the vortexes destroy all of LEGO humanity. Battle for the Win. For the first time in a LEGO videogame, players can take favorite characters in to battle and compete with up to 3 friends head-to-head. Unlock Battle Arenas with gold toy tag characters from expansion packs in waves 6 through 9 and challenge friends in 4 action-filled competitive split-screen games. 3-in-1 Building. Physically build and then rebuild toys to power-up every vehicle and gadget. Each can be built a total of three times providing super-charged, in-game abilities with each upgrade. Play Alone or with Friends. Players can let imagination guide their solo journey or have a friend join the adventure with co-operative, drop-in/drop-out play throughout the game. Go even further with 4-player competitive local play in the all-new Adventure World Battle Arenas. The Starter Pack Will Last. The LEGO Dimensions Starter Pack is a system of play that offers continued compatibility across all expansion packs. The biggest add-on for the ultimate Gamer and Master Builder. Relive the movie experience with all-new game levels! Expand the gaming experience with a new mission-based game level, along with a minifigure, a vehicle and a gadget to build and use in-game for access to new areas and more abilities. Grow the collection with a pair of minifigures and a vehicle or gadget for each, all with their own in-game abilities.